Abstract: The age and composition of monazite from ortho- and paragneisses of the Nizke Tatry Mts (Low Tatra Mts) was studied by microprobe chemical method. The monazite shows relatively uniform composition characterized by substitutions to xenotime (7–10 mol. %) and brabantite (6–11 mol. %), much less to huttonite (0–2 mol. %). Biotite-hosted monazite is commonly overgrown by thin REE-epidote rims, in a less foliated sample it is apparently unstable and breaks down to apatite, REE-epidote and a Th-silicate (huttonite?). Empirical thermometers based on Y in monazite give 600–650 ?C for xenotime-bearing samples. Extensive dating by Cameca SX-100 microprobe yielded a range of ages: the majority of data cluster around 340–360 Ma indicating either a Variscan origin of orthogneisses or strong reworking of an older granitic protolith. Because monazite recrystallized at subsolidus temperatures it seems to have failed to record a magmatic age. However, an Ordovician core (ca. 475 Ma) was found in one monazite grain from mylonitic Bystra augengneiss. This partially melted orthogneiss also contains younger monazites (320–330 Ma) which probably recrystallized during this Variscan event. Decompression-related muscovite melting was probably the reason for the partial melt formation. Metamorphic monazites from medium-grade biotite gneisses also record several ages: old inherited cores (450 Ma) and metamorphic events occurring probably at ca. 390, 350 and 330 Ma. Abstract: The paleogeography of the Alpine-Carpathian-North Pannonian (ALCAPA) realm is still a matter of debate. In order to establish a tool for lithostratigraphic correlation, the total organic carbon content (TOC), the sulphur (S) content, and the carbonate content were measured in Carboniferous sediments of this realm. The presented database consists of 260 samples from Carboniferous sedimentary sequences in the Alpine-Carpathian-Pannonian realm. The TOC/S ratio in pelagic and continental environments is in accordance with the ratios observed in several studies. A high S-content in the Szabadbattyan Formation suggests an euxinic environment in an intra-shelf position. This is a distinctive feature to all other formations of the same depositional environment. Apart from the pelagic environment, sedimentary processes in the distinct basins result in composite TOC/carbonate relationships, which are indicative for a combination of an organically controlled with a carbonatic controlled deposition. The data of this study demonstrate that the analysed geochemical data can be interpreted in terms of the sedimentary environment. 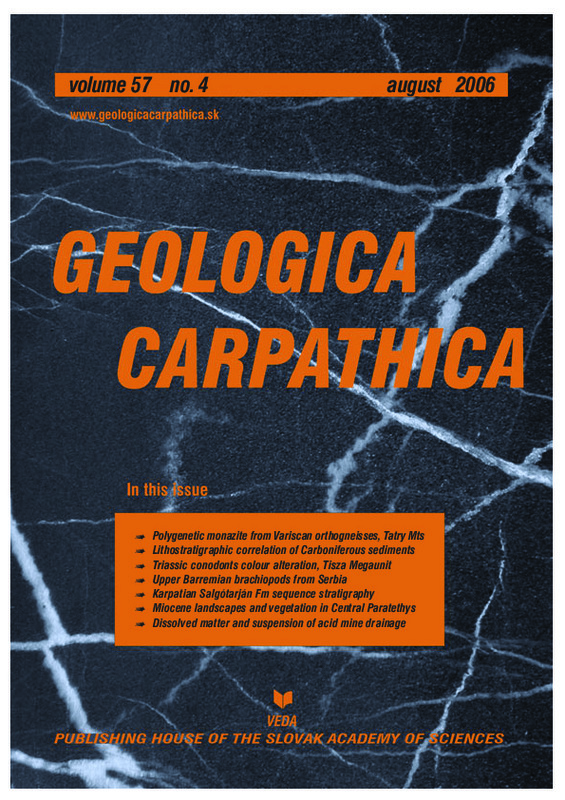 Therefore, the database can be used for a further research in the reconstruction of the Carboniferous paleogeography in this area. Abstract: A new Late Barremian terebratellid species of Dzirulina Nutsubidze, 1945 of Beziste, Suva Planina Mountain, eastern Serbia, which was earlier described by Petkovic (1930) was found at the same locality as Waldheimia (Zeilleria) zujovici Antula, 1903. The new species is compared with Dzirulina pseudojurensis (Leymerie), and the variability in the external features of this widespread species is shown on specimens from eastern Serbia through their internal structures. Abstract: Detailed sedimentological and paleoichnological investigations were done on the sandy facies of the sequence stratigraphically well researched coal-bearing sediment series (Salgótarjan Lignite Formation) in the East Borsod Basin (Northern Hungary) to provide data for paleoenvironmental reconstruction. Collection and identification of bioerosional and bioturbational reworked trace fossils were carried out within 9 stratigraphic levels of the outcrops representing 5 parasequences from the 25 of the entire series and reaching about 26 m in vertical extension. 11 sedimentological units were dissected; 11 ichnogenera and 25 ichnospecies were identified and documented in the series. Regarding the sedimentological data, the dominant facies zone of the sedimentation was the shoreface, mainly its upper and middle, sometimes its lower part, while at the lower and/or uppermost parts of the parasequences some formations of fore- and backshore and even lagoonal materials as well as open marine (offshore) sediments can appear. 4 ichnofacies, namely the Entobia, Skolithos, Cruziana and Glossifungites were determined and described by paleoichnological and sedimentological terms. Regarding these results in the framework of the sequence stratigraphic model, it can be concluded that in the researched series the Entobia ichnofacies is related to the transgressive bars below the flooding surfaces of the subsequent parasequence, Skolithos and Glossifungites ichnofacies are related to the foreshore, upper and middle shoreface of the prograding parts of the parasequences while the Cruziana ichnofacies is related to the lower shoreface of the prograding parts of the aggrading parasequences. Abstract: The digital elevation model (DEM) helps to express Neogene landscapes and vegetation on palinspastic maps with reconstructed orography. To reconstruct ancient vegetation cover, basic zonal vegetation formations and their characteristics have been defined based on diversity and proportions of zonal woody evergreen, deciduous, sclerophyllous and legume-type elements, besides intrazonal (azonal, e.g. coal-forming, aquatic and riparian) and extrazonal (montane conifer-rich) vegetation. Three time intervals have been analysed — Karpatian to Early Badenian, Late Badenian to earliest Sarmatian and Early to Middle Pannonian. After evaluating respective local sites of leaf, fruit/seed and spore/pollen assemblages, paleogeobotanical maps have been constructed for the area of the Central Paratethys and its periphery. Abstract: The impact of acid mine drainage on the Smolnik Creek catchment was evaluated approximately 10 years after the closure of the mining area. Water and suspended solids (particles >0.45 μm) were collected five times from June 2002 to July 2003. The water chemistry of 44 samples and Fe, Al, Mg, Ca, Na, K, Cu, Zn, Mn, Pb, As contents of 25 suspended solids sample HNO3 leachates were analysed. Past reclamation effort decreased the volume of water effluent from the abandoned mine system and improved their quality, which is indicated by the decreased content of dissolved matter from 7–17 g/l to 5±1 g/l. However, from the new mine drainage 860 m3/day of acid mine drainage water (pH 3.8±0.5) enter the creek and other polluted water is generated by tailings and old dumps. Elevated contents of Fe, SO42–, Cu, Zn, Mn in comparison with the water limit (CD 98/83/EC) were detected in the creek water 16 km downstream the mine, near the confluence with the Hnilec River. The total mass of suspended solids seasonally increased 2–3 times under the mine because of iron oxyhydroxides generation in the mine-creek water-mixing zones. The suspended solids transported substantial doses of iron, Al, Cu, As and other elements, which can be the same or even higher than is removed in dissolved form. The suspended solids analyses documented the immediate impact and quantity of mine-derived pollution enlargement in the catchment and they increased objectivity of environmental impact assessment.